Did you know that Halloween is the busiest day of the year in the Pizza business? One thing that hasn’t changed over the years is people’s love for Pizza! It seems like we can’t get enough of it and there are new stores opening every day. 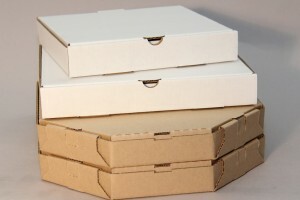 Corrugated pizza boxes have been the packaging of choice for the industry thanks to their moisture wicking and insulating benefits. Crown Packaging has supplied to the pizza industry for over 50 years. 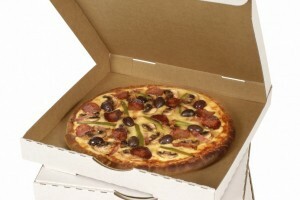 Whether plain pizza boxes for the small Mom & Pop pizza joint or 5 color print to large National chains, we can help. 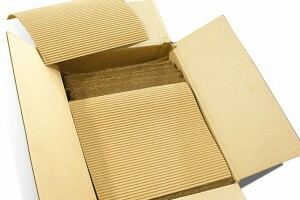 We have experience with various box designs, and have stock cutting dies for many sizes and depths. We have the capability to provide you with Kraft or White boxes in various flutes including E, C or B. Moreover, our pizza boxes are manufactured in Canada with materials that are CFIA Canadian Food Inspection Agency approved as food safe. Your guarantee that the box your pizza is sitting on is safe to eat off of.